Variant is the official magazine of the Philadelphia Science Fiction Society, issued bi-monthly. Rates are ten cents a single copy, six issues for fifty cents, one dollar for twelve. Editorial offices[[?]] at 122 S. 18th St. Phila 3, Pa. All articles and co[[? ]]ations for or concerning this publications should be sent to the editor at the above address. 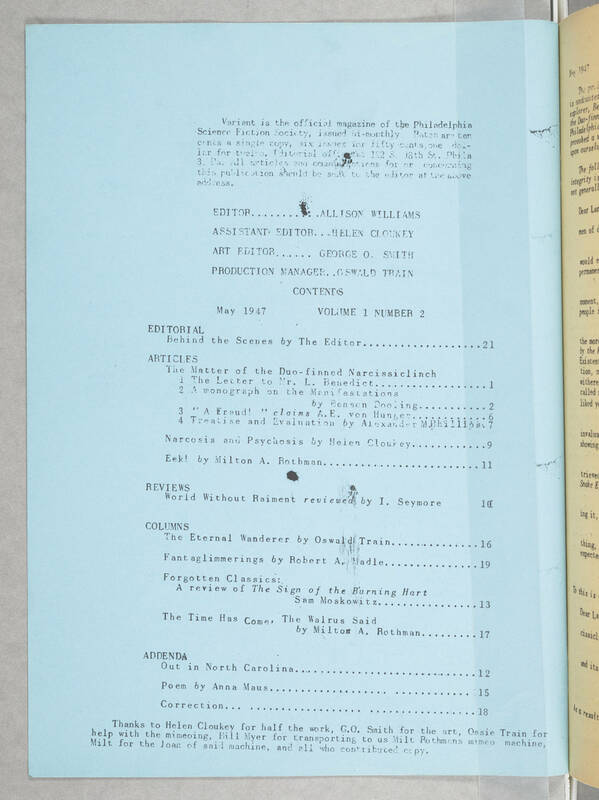 EDITOR.....ALLISON WILLIAMS ASSISTANT EDITOR...HELEN CLOUKEY ART EDITOR..... GEORGE O. SMITH PRODUCTION MANAGER..OSWALD TRAIN CONTENTS May 1947 VOLUME 1 NUMBER 2 EDITORIAL Behind the Scenes by The Editor.....21 ARTICLES The Matter of the Duo-finned Narcissiclinch 1 The letter to Mr. L. Benedict.....1 2 A monograph on the Manifestations by Benson Dooling.....2 3 "A Fraud!" claims A.E. von Hunger.....6 4 Treatise and Evaluation by Alexander M. Phillips.7 Narcosis and Psychosis by Helen Cloukey.....9 Eek! by Milton A. Rothman.....11 REVIEWS World Without Raiment reviewed by I. Seymore 10 COLUMNS The Eternasl Wanderer by Oswald Train.....16 Fantaglimmerings by Robert A. Madle.....19 Forgotten Classics: A review of The Sign of the Burning Hart Sam Moskowitz.....13 The Time Has Come, The Walrus Said by Milton A. Rothman.....17 ADDENDA Out in North Carolina.....12 Poem by Anna Maus.....15 Correction..... 18 Thanks to Helen Cloukey for half the work, G.O. Smith for the art, Ossie Train for help with the mimeoing, Bill Myer for transporting us to Milt Rothman's mimeo machine, Milt for the loan of said machine, and all who contributed copy.